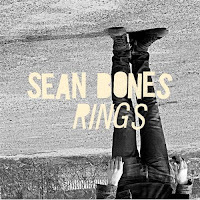 New York based Sean Bones released Rings today, July 21. For those unfamiliar with Sean Bones, they play reggae based indie pop. I'm not normally into anything reggae aside from a few old school things so, it may come as a shock to anyone who knows me that I would like this band. But, I saw them perform at the end of May and they put on a hell of a show and thus the reason I decided to check out the record. Rings is full of laid back summertime listening. The highlights for me are "Dancehall" and "Sugar In My Spoon" the latter of which is a must see live. Live the song is one of those combo "say wha ... well damn" things. That aside, the studio version is just as enjoyable. I'd say if you like your indie pop firmly ensconced in reggae beats, you'll like this record. It'll be the record you throw on late into the barbecue and dance with your friends, drink firmly in hand. If you're in NY, then you have a few chances to catch the band. They're having a record release party at Glasslands in Brooklyn tomorrow, July 22. If you can't make that, they'll be tearing up the LES at Pianos on July 30 and at Mercury Lounge on August 7. So, go check them out. The initiated already know they'll get a good show. Those not in the know, go, you just might find yourself like me, wowed by a killer show.